Home » Do You Want Neck Pain Treatment or Neck Pain Relief? You don’t want neck pain treatment. You want neck pain relief. A patient of ours, Diana, thought she wanted neck pain treatment. Until she went to see 30 neck pain specialists and realized they were offering “treatments”, not “relief”. The true desire is for your neck pain to go away. If it were just about neck pain treatment, well, then you can get that anywhere. 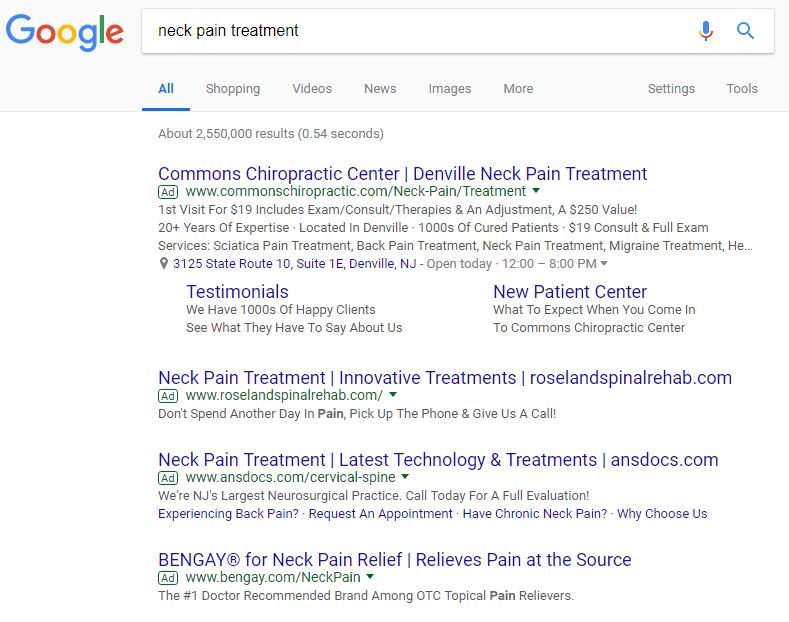 Google “neck pain treatment” and you’ll find all sorts of techniques and therapies. Here, I’ll do it for you. The first two ads are for chiropractic adjustments. The third ad is for neck surgery. The fourth ad is for BENGAY. Really? Those are the options for neck pain treatment? If you don’t see how those are poor options, let’s think this through. You can’t blindly pick an answer without knowing a problem. Just because cupping, kinesiotape and rocktape, and physical therapy are in the news or what medical doctors are taught to use when you have physical pain does not mean that it’s going to make your neck pain go away. Blindly choosing a treatment leaves you open to wasting time, energy, and money. Ads #1 and #2: Do you need to be ADJUSTED as your chosen neck pain treatment? What exactly needs to be adjusted by a chiropractor? You could be misaligned, but if this problem and solution match were working, then chiropractors wouldn’t be working to see more than 10% of the American population. The fact that they’re not seeing 25% or 50% of the population says something. Chiropractors are letting people down. Not all chiropractors, just most of them. Ad #3: Maybe getting CUT OPEN is the neck pain treatment that will fix you? Surgery for your neck pain? You haven’t even checked to see if you have adhesion yet (more on that below). Fine, get some BENGAY. It’ll make you feel warm and tingly. You may even get some temporary relief for an hour. But how is this fixing your neck pain problem? If you’re still reading, my goal for you is that your neck pain goes away, permanently. What Problem Requires What Neck Pain Treatment? If there was a pile of wood sitting in front of you, you wouldn’t pick up a hammer and start hitting pieces of wood. People would look at you like you were insane! You wouldn’t pick up a hammer unless you had a nail. Choosing one of the neck pain treatments that Google recommends is like being an insane person hitting pieces of wood with a hammer. I’ll point the finger away from you and at other people now. Then, after choosing any random neck pain treatment, they wonder why their neck pain doesn’t go away? You need an accurate and complete diagnosis. You need to start treatment with the biggest problem causing pain. Having an accurate and complete diagnosis is like watching a 3 year-old child put together a 4-piece puzzle while having 4 puzzle pieces. An inaccurate and incomplete diagnosis is like having the child desperately try to put the puzzle together with only 2 puzzle pieces. Impossible to complete, you and I both know that will only end up in tantrums. After your neck pain is diagnosed correctly, you can get the largest puzzle piece addressed with the right solution. 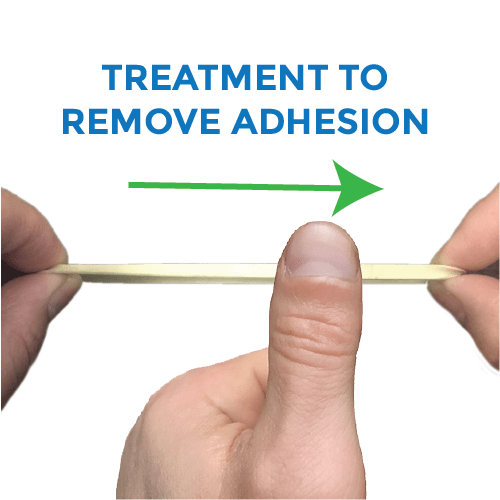 It’s a problem called adhesion that’s rarely talked about by other healthcare providers and is very easily removed by an expert. Oh! You mean the knots at the bottom of my neck? 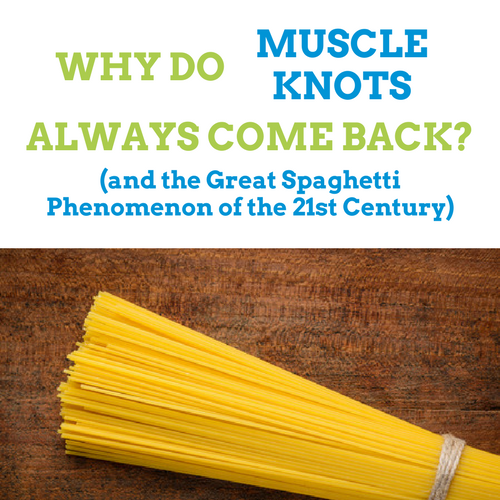 Treating knots causes people to feel great immediately after, only to have the knots come back in 1-2 days. Adhesion is thick. It acts like glue in and between the muscles. It feels like a well-done steak when an expert pushes into it. When the adhesion is pulled tight, it feels like a rubber band being pulled under the finger. Can I just get a massage for my adhesion? 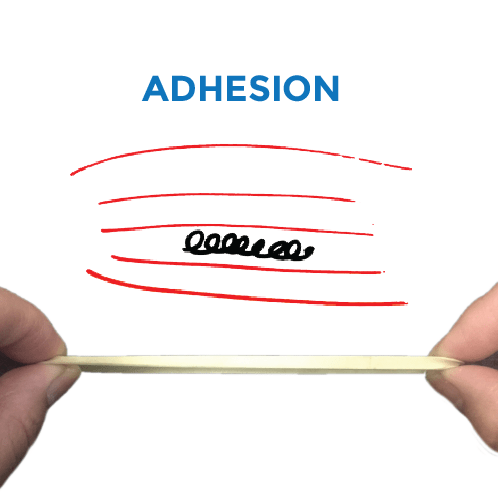 Adhesion only breaks when you apply tension (remember physics class?) to it. Pretend this rubber band is a normal muscle at rest. You can literally have an elephant stand on it (compressive force) and nothing would happen to the rubber band. However, find a random 5 year-old to pull it apart and it’ll break. Now, a healthy muscle, when stretched, will pull a little bit. 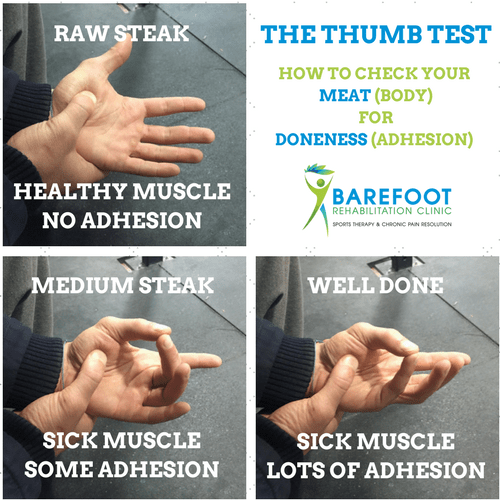 A muscle with adhesion in it, when stretched, will pull A LOT. When a doctor feels adhesion in the muscle, he pushes into the muscle to get into the adhesion, then puts tension on it by stretching the adhesion. You can feel this by having a friend put tension on a rubber band, then stretching the rubber band by creating friction and feeling the rubber band pull back on your thumb. 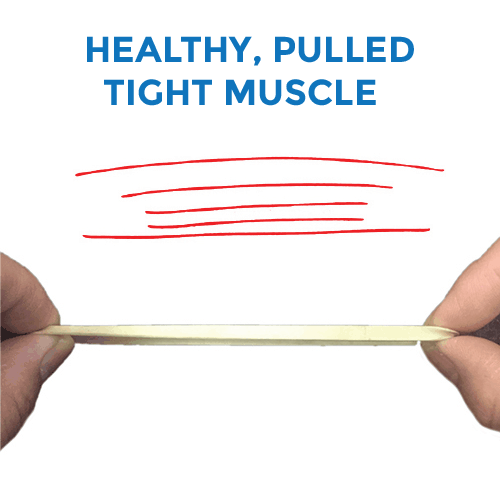 When the doctor feels the adhesion tensioned, stretching the muscle will break the adhesion. This is what neck pain treatment that provides relief looks like. Ask Yourself: Do you want Neck Pain Treatment or Relief? Do I want neck pain treatment or relief? Treatment means that you’re shooting in the dark when it comes to your problem. Relief means that you have a complete, accurate diagnosis and you’re providing treatment for the biggest puzzle piece to your problem. Answering the question can save you months to years worth of time, misused energy, and thousands of wasted dollars. Not to fail to mention that your pain won’t go away now or 30 years into the future if you don’t get diagnosed. What has your experience been with neck pain treatment? What did you learn when it comes to your body?